It was not so long ago when the old-time working cowboy was kissing his sweetheart goodbye and he would head out on the open trail. These drifting cowboys commonly signed on to drive thousands of head of cattle long distances without modern conveniences and working from the back of a horse. Those incredible drives could take as long as one year. The pace was slow, averaging two or three miles per hour. A 1,500 mile journey might take 4 months and then a cowboy had to trail the entire distance back home. The trail was hard work with no Sundays or holidays. A buckaroo was up before the sun and still in the saddle many times after dark. He took his meals, sleep, bathroom breaks and small comforts in the open and on the run. Wind, rain and sun were unavoidable and met head on. The trail hand also took his turn “night- hawking”. This chore meant babysitting the cow herd at night which boils down to a great deal less sleep. Trail herding as you can see was a tough row to hoe with hard work and low pay. It was also a lifestyle. 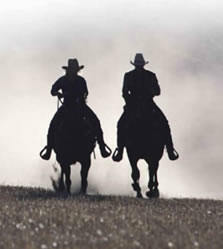 It was a lifestyle of freedom where the best cowboys took pride in their work and in their dress. For the top cow punchers it was about being the best at a trade, a trade we call cowboy. Top hands from Texas, the Southwest and including the Vaqueros of California developed an art form of cattle handling, roping, bits, saddles clothing and equitation that we call horse-man-ship. From this old time pride the modern equine events have evolved. Bronc riding, roping, cutting, barrel racing, dressage, jumping, pleasure classes, trail classes, ranch rodeos and more. It is about being the best and each one revolves around the horse and great horsemanship. e from it, many cowboys ride with their cell phones as handy as their reins. In the old days the country was open and unfenced. A man was free to ride when and where he pleased. The only unfenced and open range today is the highway and the sky. Modern day traveling cowboys make the most of both in private and commercial jets or in trucks and trailers that easily value over $100,000.00, where he racks up and logs thousands of miles in the air and on the road. It is not uncommon for me to do a demonstration in front of 1000 people in California on Friday and be giving a private clinic on a ranch in Texas on Saturday. So goes the life of a cowboy gypsy. It is a fast-paced quick moving lifestyle that sometimes seems like a blur. It is motels, sleeping bags and all night drives. It is photo finishing into your destination with just enough time to “chap up” and work a rank old colt in front of an enthusiastic crowd. What a life! But in the long run and in the end it is still about the same thing it was about 150 years ago. With all the traveling and all the exposure to radio, TV and magazines the bottom line is still like the old days; it is about the quality of a cowboy’s work that counts. The work only continues to come, not by just “talking the talk” but you need to “walk the walk”. Great and aspiring horse people keep an open mind and a positive attitude through good times and bad, through highs and lows. Cowboying is still about a solid work ethic. It is about your word and your reputation and being able to honor both with a handshake. After all, honor is a principal that builds great relationships like a relationship bond between men, women, horses, livestock and the land. Whether you are on the ranch, the road or in the office a guy can still be a cowboy because being a real cowboy is a way of life and about keeping this way of life alive. It is a tradition the old-time cowboys fought for and believed in. It is our turn to keep it and preserve it. Some people say cowboying is extinct. I think it is growing! In the sixties and seventies it might have gone into remission but thanks to people like Roy Rogers, Casey Tibbs, Larry Mahan, Ray Hunt, Tom Dorrance, Ty Murray, Red Steagall and thousands more, it has comeback. I think the old-timers would be proud and happy to know how cowboys and horses are going strong and getting better.